When I found out I was pregnant I knew we had to find a double pram, as by the time our little girl arrives, Skyler will only be 1 and a half. He is a good walker and loves it, but at that age I don't want to rely on him being able to do it at all times, especially since we spend 2 hours a day going back and forth to the kids school! Pretty tiresome even for me. So I had a look everywhere, trying to find a pram that has several options in terms of how they can be angled. I also wanted something lightweight, easy to manoeuvre, and that wasn't wide like a side by side stroller - as these are simply too wide for most old sized doors to get through. In the end I felt I had two choices - The Oyster Max or the iCandy Peach 3 Blossom. 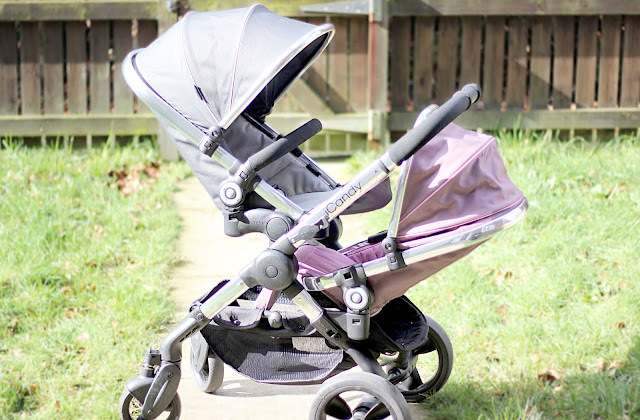 Pricewise they are quite different; The Oyster Max double comes in at around £600 and the iCandy Peach 3 at £900+ (if you want it with carrycots you'll have to pay around £1400). Both had similar reviews and both seemed equally as complicated. 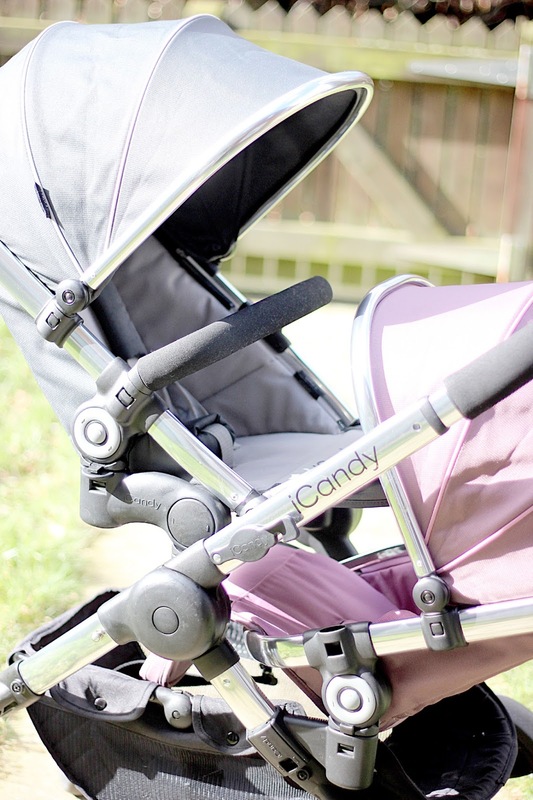 I decided to go with the iCandy - this one also has a pink carrycot that I will be using when our new arrival is tiny. I have yet to take it out for a spin, and it will be used by Skyler in the top seat until our baby is here. And that's what's great about it - it converts from a single pram to a double with (quite a few extras) - adaptors, converters, elevators and additional seats. Pheeew. We already noticed a fair few annoying things. For the price of this pram we assumed everything would have been integrated - that we could switch the seats and carrycots around however way we wanted. But after some hours realised that's far from the case. The main seat can't be on the bottom (unless very tightly squeezed in and no room for the child) and the lower seat has a permanent fold as a leg rest which means it will completely block the head space of another lower seat, if used as a top seat. iCandy also informed me that the lower carrycot should not be used on top (even though it clicks in fine) so is very limited as to how it can be faced. The top seats foot rest can't be folded down when a lower carrycot is attached, unless the bumper bar is removed - making it less safe for a newborn baby. And finally, even with the correct seats in the correct position the main seats foot rest is very 'in the face' of the lower seat. I've waited 8 years for my girl, and to be honest I won't be putting her in a grey pram - it has to be pink! So it already has the life span of... about a year. Better luck next time iCandy!